Ultra Fine Flair: Do They Know^WCare It's Christmas? Do They Know^WCare It's Christmas? This year, I attended an 80's-themed Hallowe'en party. You can see DLang in that video about halfway through, decked out as Robert Smith and vamping with Madonna, and I'm near the end as Cyndi Lauper also with Madonna (who was clearly a total lip-sync whore). One of the songs they played was Band Aid's "Do They Know It's Christmas?" Confession: I used to love this song so much that hearing it actually made me a little teary. And by "used to" I mean as recently as last year. It reminds me of high school and Brit pop and my first-ever cassette tape (Wham! 's Make It Big) and makes me all sentimental. After hearing the song a few times on the radio this year and listening more closely to the lyrics, it still makes me tear up - only now, because I'm laughing so hard. 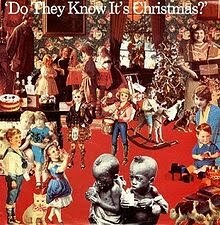 There was a famine in Africa in 1984 when the song was recorded, and I'm sure that when Bob Geldof was inspired to record the song to raise money for Africa, he had the best of intentions. Let's review the lyrics to see how they've held up since the song was first recorded 12 years ago. Hm. Who are these "other ones" for whom George Michael asks us to pray? The "bitter sting of tears" - that's classic. And it only gets better. Can you say, "white man's burden"? "We feel sorry for Africa, because it doesn't snow there. And also, they don't have Christ, which we as famous British rock stars know that everyone needs, oh, and George, can you pass the eggnog? No, not that one, that's Sting's vegan mix without the rum. Right, that's the one." "Thanks for that eggnog, that's the stuff. I heard Bob was going to get us some ice, too. No, we're not going skating, Sting. Go back to your tofunog. Simon, tell Boy George I'm going to be in the third stall, he'll know what I'm talking about. Cheerio!" That song is hilarious, I had never listened to all the lyrics before. During our discussions about when we were going to get Griffin baptised already I told my mom Julian was 1/2 Jewish and she did not believe me. Of course now at our athiest heretic house we are totally going all out for Christmas anyway.